Corrosion Control, Inc. (CCI), Re-Steel’s epoxy coating facility, opened in Auburn, N.Y. to enhance the lifespan of rebar embedded in concrete used for corrosive environments. - Re-Steel Supply Company, Inc. Corrosion Control, Inc. (CCI), Re-Steel’s epoxy coating facility, opened in Auburn, N.Y. to enhance the lifespan of rebar embedded in concrete used for corrosive environments. 2004 Corrosion Control, Inc. (CCI), Re-Steel’s epoxy coating facility, opened in Auburn, N.Y. to enhance the lifespan of rebar embedded in concrete used for corrosive environments. 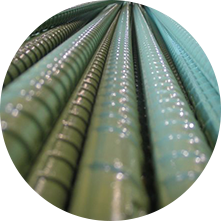 Strategically located next to a major supplier of reinforcing steel, this downstream operation greatly enhances our ability to serve our customers with their epoxy requirements. The CCI facility has state of the art equipment and an annual capacity in excess of 30,000 tons.